2010 (60 Plate) Vauxhall Corsa 2010, 1.0 Litre Ecoflex 12v S 3dr. - Car has been professionally washed & cleaned inside and outside. - Cash on collection ONLY. - A few scuffs and dings on the car, but this is expected for a car its age. PART HISTORY LONG MOT SPARE KEY 5 DOOR REMOTE CENTRAL LOCKING ELECTRIC WINDOWS ALLOY WHEELS AIR CONDITION HPI CLEAR EXCELLENT RUNNER PLEASE CALL FOR MORE INFO: 07957199037. VAUXHALL CAVALIER 1.8i LS - MK3. I have had the car for 22 years. It has low mileage for its age, which is genuine miles. The car had 1 previous owner. Has been well looked after, and was used daily and has only done approx 500 miles a year over the past 5 or more years. Vauxhall Signum Turbo v6 2.8ltr Super Rare 2006 5 Dr(12m Mot,Service History,1 of 10 in Uk). A opportunity to own a Very Rare Vauxhall Signum V6 Turbo 2.8ltr hatchback which has a excellent specification being the Design model as per the list above. I’ve had the Zafira for nearly 10 years - used daily and very useful for carrying children and lots of luggage. The car runs faultlessly and has never broken down in the years that we have had it. It has never been abused or driven aggressively. It is also very surprising how much you can fit in it. And 2 years ago i fitted a new crank sensor. Vauxhall Vectra Supertouring 2.5 V6. Huge folder of paperwork! ADVERTISED ELSEWHERE. NO WARRANTY GIVEN OR IMPLIED. SPAERES REPAIR DUE TO BODYWORK. 2009 1.2 Corsa. Radio/CD player. Well looked after. Used as a runaround. All dealer paperwork. Alloy Wheels. Full service history. Vauxhall Zafira. Mot: 20/04/2020. Mot Certificate Present. 1.6 Energy. This Vehicle Is in Excellent Condition For Age/Miles. Viewings Can Be Made Mon-Tue 9am-5pm Wed-Sat 9am-4pm. RESERVE IS SET AT £900. Vehicle does not run - Spares or repair - SOLD AS SEEN. Engine is seized - suspected oil pump or oil pickup seal failure (oil pressure low alarm just before failure, no other alarms/warnings/codes). Car will be supplied with the two keys, car manuals, a warning triangle, wheel wrench, space saver tyre and jack. Vauxhall Corsa 1.4 Sxi 5 door 09 reg, 2009, No Reserve. So in a nutshell the car has done relatively low miles. We have started the corsa driven it around the yard, engine is very quiet, has been parked up so will require a clean inside and out, may possible have this done. Venture - Call us on 441202007309 or click here to find out more. Interior is the SRI cloth interior it is generally in good condition apart from the driver’s seat, it has wear to the bolster and back panel as per the pictures, rest of the interior is fine. · Last MOT advised of an oil leak and there is no evidence to suggest this has been rectified. But this still has low mileage of 90,313. But other than that this is a very clean car. - boot door has a dint in it. - has a crack in back passenger panel ( which was there when I brought it). - Need new oil sensor. First will see will buy. Any inspection. Astra vxr turbo. Astra vxr fuel rail. Astra vxr fuel injectors. Astra vxr MAF sensor. Astra vxr LUK clutch and flywheel. New head gasket. It does have 112.000miles but recently has had a whole new bottem end with 39.000 on it. The last service was 60000 miles so it's probably due a another about now. The service book is stamped up as can be seen in the pictures. The V5 is present, and the MOT runs until 5th September 2019. Only ever run on Shell V-Power Diesel. This car drives brilliantly, it is smooth with lots of power, despite the high miles. Miles accumulated are nearly all from motorway travel. (Used for daily 180 mile commute). Vaxhall astra 1.6 design. Has few wear and tear u would expect for age. While I was there the garage said it will need an alternator within the next 12 months as its starting to make a sound, but again this is not a big job and there is no rush for it. It has been a fab family car, and is in great condition for its age and has the expected scratches and one 50p size ding on the rear wheel arch see pic. I HAVE DESCRIBED THR CAR AS IT IS AND THERE IS NOTHING TO HIDE. BODY HAS A FEW MARKS AS SHOWN IN PICS BUT NOTHING MAJOR, ALL AGE RELATED. MOT END SEPT 2019. NO RESERVE . 1998/R Vauxhall Frontera Niagra Special Edition. A rare opportunity to own an immaculate example of the Frontera. It runs faultlessly and drives impeccably, really an example that needs to be seen to be appreciated. Vauxhall Signum Design 2.2 Petrol. 134000 miles. MOT valid to 28/02/2020. New catalytic converter fitted February for MOT. Vauxhall Corsa 1.3CDTi 16v SXi 2004 54 REG. Convertible electrics working. New folding roof pump fitted 2016. Leather upholstery. Regularly serviced with history. Good body condition. Corsa VXR 1.6Turbo 2012. 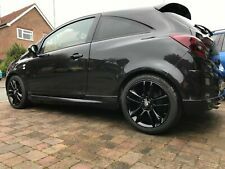 Gloss black VXR diamond cut 18” Alloys. This is truly a car worth its money! No lights on the dash. All manuals and paperwork. Heated back window. Arden Blue interior Sport Mats. Vauxhall Zafira 1.9 CDTI ACTIVE. 85K MILEAGE GENUINE. 12 MONTHS MOT. NEW DROP LINK. Car has a few marks around nothing major. CLUTCH AND GEARBOX SMOOTH NO WHINING OR CLONK NOISES. NO LEAKS OR RATTLES. Northend Motor Company Ltd - Call or visit us to arrange a viewing or test drive - Call us on 441382214950 or click here to find out more. FINISHED IN GLEAMING BLACK WITH CONTRASTING TRIM, THIS CAR HAS COVERED 98,000 MILES WITH ALL MILEAGE VERIFICATION, MOT JANUARY 2020 UPGRADES INCLUDE ELECTRIC WINDOWS, AIR CONDITIONING, MULTI FUNCTION STEERING WHEEL, REMOTE CENTRAL LOCKING, ARM REST, ISOFIX SYSTEM, POWER STEERING, ADJUSTABLE STEERING COLUMB, HEIGHT ADJUSTABLE DRIVERS SEAT, ALLOY WHEELS, DRIVERS/PASSENGER AIRBAGS, AND MANY MORE EXTRAS, DRIVES WITHOUT FAULT AS ANY TEST DRIVE WILL PROVE, HAS A MILEAGE RELATED MARKS AS YOU WOULD EXPECT FOR ITS AGE, PLEASE CALL TO ARRANGE A TEST DRIVE,.